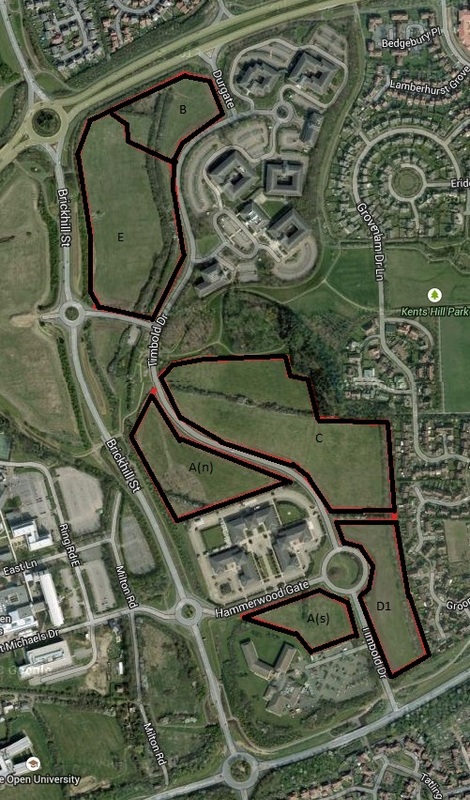 MK Development Partnership has appointed a developer to develop the site off Ladbroke Grove in Monkston Park. The site will be developed for general housing after plans for older people’s housing fell through. The plans should be submitted soon. Please let us have your email address if you want the Lib Dems to notify you when they come in. We hope to have an exhibition of the plans on Monkston Park. The MK Local Plan designates the area around Walton Grange for development, and a number of plans and development briefs have been prepared that will shape the developments. This article gives you an overview, with links to more information about each part. It will be updated as things change. The phase 1 plans (see below) are now out for consultation, until 25th October, so have your say! A planning brief defines the development opportunities and constraints and suggests a broad general shape that the development might follow. For larger developments, Outline plans and Reserved matters (the rest of the detail) then follow, while for smaller developments, we go straight to a detailed plan. Both the development brief and the plans are consulted on, so you have the chance to express your views. However, it’s important to understand that what the Council is allowed to insist upon, and sometimes even what they are allowed to propose, is limited by planning law. The area around Walton Grange is divided into two: the area currently owned by MSD, the company opposite across Hulwell Gate, and the area currently owned by MKDP, the Council’s development arm. The MKDP area, known as Walton Manor, was the subject of a Development Brief consultation last year. If you want to see what was consulted on, then please click here, and search for the keywords Walton Manor. The brief was delayed for a variety of reasons, and extra technical information has led to a change. The new version is being prepared at present, and will be published soon. We will update this article when it comes out. We’re not expecting any plans until well into 2016. MSD also want to develop their existing land, in three phases. Phase 0 covers the land immediately across Hulwell Drive in front of the flats on Walton Grange. The plan is to build a very small water treatment plant (basically relocating one they already have), together with a small visitors car park, and a row of landscaping by the road to screen it a little from the flats. You can see the information we put out on it here. 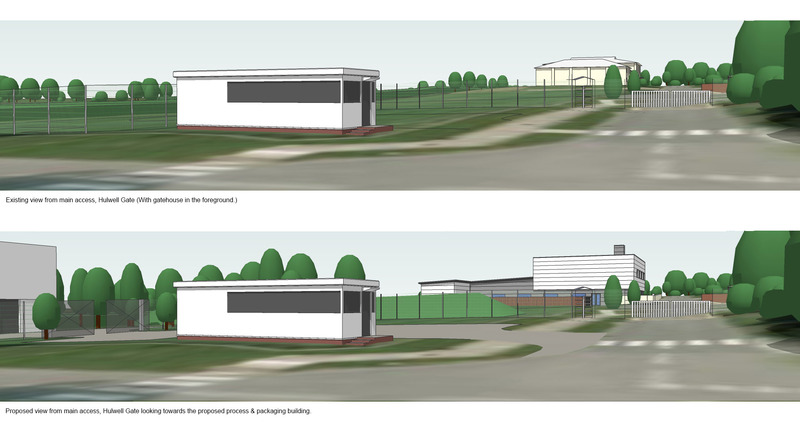 Phase 1 will include building a new small production plant (to replace an existing one) on the land further in beyond the treatment plant, with landscaping to screen it, and extensions to the car parks near the V10. They will also add an extra lane to the HGV access within the site, so that vehicles can queue there, and not on Hullwell Gate. See our leaflet for more details and search for plan 15/02293/FUL on the Council’s website here. The planning application is out for consultation until 25th October 2015, so please get your comments in, and let us know if you still have any questions. We have obtained mock-up views of the plant from outside the Abells Close flats and the Harley Drive flats. 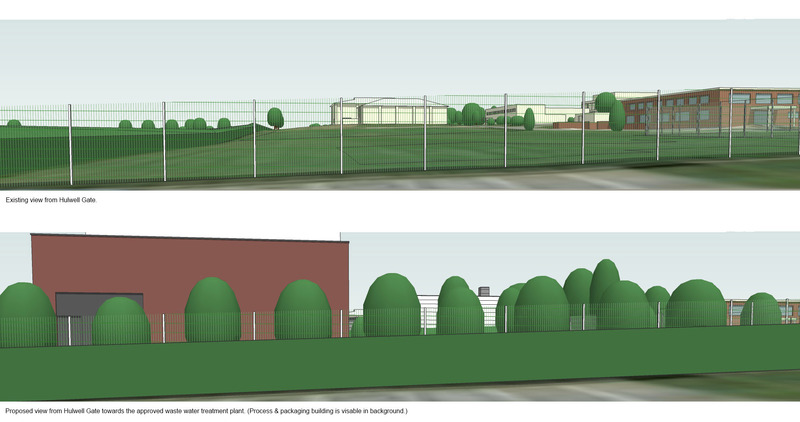 Phase 2 will cover two more buildings within their site, and a new large car park near the H9 and access from the H9. That may reduce traffic on Hulwell Gate. They have not finalised the planning application yet, so there is nothing to see, but they will do so soon and we will update this article when they do. The leaflet describes a little more about the phase 2 intentions. MSD, the company opposite Walton Grange, are intending to start the further development of their land. Cllr Jenni Ferrans and a local resident went to see the site and got more explanation of what they are planning. You can see a diagram here, or the plans on the MK Council website here and search for 15/00385/FUL. A new small water treatment plant will replace the existing one on the site. It will be fully contained. The waste water is piped into sealed tanks, and treated. That is the same way that it operates at the moment and there was no odour standing just outside the tank shed. The existing pump can’t be heard or felt even 2 metres away, let alone across the road in a building, so there should be no disturbance from that. The new one will be similar. A new access road within the site is to start to help reduce congestion on the main road. They will do more work within the site once the first changes are done, that should reduce the queues significantly. It won’t change the amount of traffic along Hulwell Gate. A new small visitors parking area will normally only be used in office hours and gives them only a few more spaces than at present. A loading/unloading bay will only be used to deliver chemicals to the treatment tank: one vehicle once a fortnight during office hours. Both Cllr Ferrans and the resident agreed that there should be no impact on residents apart from the loss of the green field view. Sadly, since the whole area is designated as industrial, there is no protection for that. Update: the plans were approved in summer 2015 and work will start in November/December 2015. Development of some sort will come to the west of Kents Hill near the V10 over the next few years. Our special Focus edition explains why, what is being considered, and how you can input to the decision. We’re fighting to ensure that, whatever comes, adequate infrastructure comes with it, so that existing residents don’t suffer as a result of the new development.